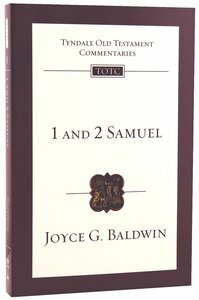 About "1&2 Samuel (Re-Formatted) (Tyndale Old Testament Commentary Re-issued/revised Series)"
Joyce G. Baldwin (B.A., B.D.) was principal of Trinity College, Bristol, and wrote several volumes in the Tyndale Old Testament Commentary series and The Bible Speaks Today series. She died in 1996.